Xiaomi has announced three new smart TVs in its Mi TV line-up ranging from HD Ready panels to 4K televisions. All three run the updated Patchwall TV OS based on Android TV, so you get support for all Play Store apps out of the box. All also include voice command support thanks to Google Assistant. The lineup includes the Mi TV 4C Pro, a 32-inch HD Ready TV, priced at Rs 14,999. 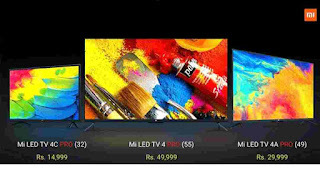 Then there's the Mi TV 4A Pro, with a 49-inch full HD panel, and a price tag of Rs 29,999. Rounding up the list is the flagship Mi TV 4 Pro, a 55-inch 4K smart TV with a price tag of Rs 49,999. The new TVs will go on sale on October 9 and 10 on Flipkart, Amazon.in and Mi.com.